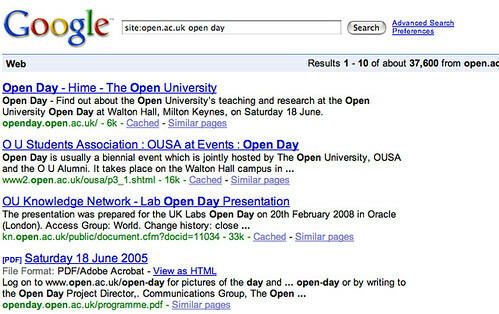 More and more search boxes now try to help the user out by making search completion recommendations if you pause awhile when typing query terms into a search box. 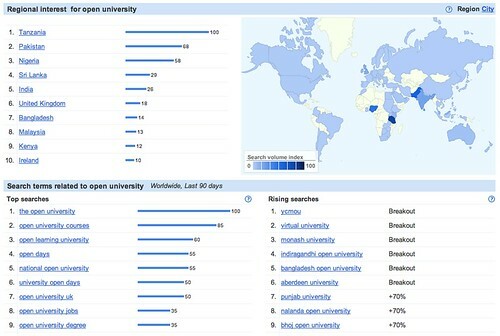 Tunneling down to look at searches for open university from the UK, I notice quite a lot were actually looking for information about university open days… Hmmm… do we have a permanent “open day” like web page up onsite anywhere, I wonder? I think that’s a great idea. 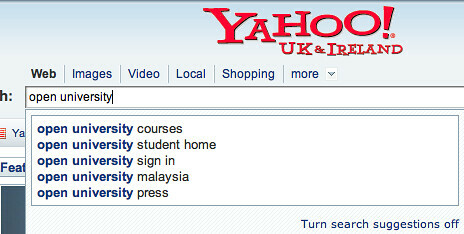 I know marketing have been looking at targeted advertising on Google. 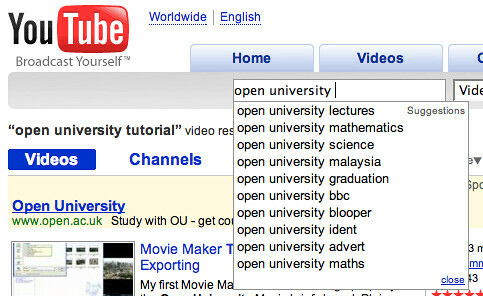 The results from searching the OU website are frighteningly irrelevant! The Itunes Open University ( http://www.open.ac.uk/itunes/ ) is a great effort which brings significant awareness simply through its high quality and popularity. Friends of mine with zero knowledge of open education and access as a whole have stumbled upon it and been instantly converted to the cause. When this is combined with other awareness programs (I was then able to direct him to some of the other great open access resources that are covered by this blog) it can be particularly potent. Next Next post: Time to Build Trust With an “Open Achievements API”?